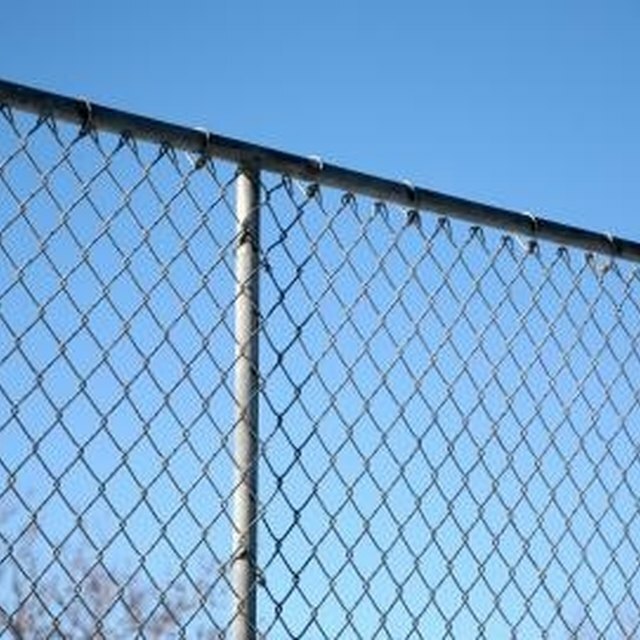 Wire mesh fencing is a good choice to install around your yard when you're less concerned with privacy and more focused on security. A strong wire mesh fence can prevent both wildlife and human trespassers from accessing your lawn, especially if it is six feet tall or higher. A mesh fence is also a good choice to place around a garden to protect your plants or around a pool for a little added safety when you're not there to keep an eye on it. Determine exactly where you would like to install your fencing. Then walk around the perimeter placing stakes in the ground every 10 feet and each time you turn a corner. Each stake represents one post. Once you have all the stakes in place, tie a clothesline to the one you finished with. Repeat your walk in reverse order, feeding the line through the stake loops as you go. Whenever you notice the clothesline isn't straight move the stake to fix the alignment. Go to one of the terminal stakes (those that are at the corners or against the house) and pull it out of the ground. Dig a 10-inch wide hole with your post hole digger that is 1/3 of the height of your terminal fence posts (which are slightly taller than the others). Repeat this action for the remaining terminal stakes. Turn your attention to the remaining stakes in the ground. Pull each one up and replace it with an 8-inch post hole that is 1/3 the height of your traditional fence posts. Fill your wheelbarrow with a mixture of four parts gravel, two parts sand and one part cement. Mix water in with the cement two minutes beforehand as directed on the package. Add the appropriate post to each hole. Then pour the mixture you just made in to fill it up until you reach ground level. Wait one day for the posts to set. Then find your tension bands. Put one on each terminal post, sliding it down 10 inches. Measure 2 inches up from each tension band and attach a brace band. Top off each terminal post with a post cap. Then top each of the remaining posts with a loop cap. Take your top rail and thread it through each loop cap. Then use a carriage bolt to attach it the brace band at each terminal post. Each time you turn a corner, begin with a new top rail. Unroll the wire mesh and attach it to the tension band at the far left corner, again using a carriage bolt. Then unroll it as you walk along your posts. Use wire ties to attach it to the top rail at 2-foot intervals. Use an additional carriage bolt to attach it to each tension band as you pass each subsequent terminal post. Make your post holes slightly wider at the bottom to better accommodate your cement mixture.